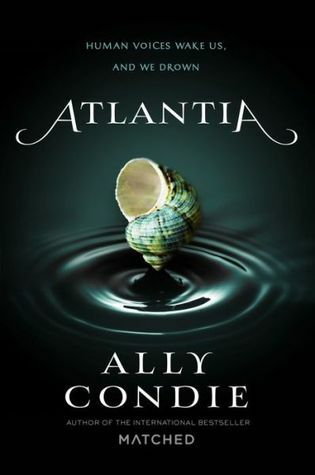 I liked Atlantia! I do have mixed feelings about it, but overall, I liked it. I really liked the world of Atlantia. To me, there were very strong feelings of a lost, ancient civilization driven underwater- to the point that it feels very much like an Atlantis re-telling. Partly because of the world, but mostly because of the name. Still, as much as I loved Atlantia, and the idea of it, I still couldn’t picture completely in my mind. I mean, I used my imagination quite a bit, and there’s nothing wrong with that, but I also felt like the descriptions in the book didn’t come to life. There were also things that didn’t make a lot of sense. Like how people had to go undersea because things on land were really bad…and yet they survival under water depends on those that they send above. I’m also curious about the sirens. They are there, and some people are just born that way, but no explanation is given. Well, that I can recall, because if there is one, it clearly didn’t stick. I did want more from this world, and since the book is a stand-alone, we don’t get to go into this world that much. For a stand-alone, though, it’s okay. I feel like this book was more about Rio finding her voice than anything else. I feel like the relationship that Rio has with Bay is something a lot of people will focus on with this book, but I honestly didn’t care about their relationship. Bay seemed like a horrible sister, in that she made Rio promise to stay, knowing she wanted to go above, only to do so herself. While I get that things needed to go a certain way for Rio, and that I’m an only child so I have no clue what it’s like to have a sibling, I still felt like their relationship didn’t matter in the grand scheme of things. Really, I’m not sure how I feel about any of the characters. It felt like like they were just…kind of…there. I didn’t really care about what happened to any of them, and I felt like I didn’t really get to know them at all. While I liked the idea of Atlantia, and how Atlantia felt, I didn’t really care about the characters. And I really wish we knew more about this world, because I kind of felt like I supposed to know every single detail about this world despite the fact that we get the very basics on Atlantia and everything that happened. Still, Atlantia gets 3 stars.